The two legendary voices look back at the history of the Boys in Blue. “When the Dodgers left Brooklyn and arrived in Los Angeles, the team really didn’t have a character of any kind. They came out here and finished seventh in an eight-team league. They were playing in a football/track stadium, not a baseball park. And an awful lot of people were not from Los Angeles. They were from all over the country. So it was indeed a big, empty place to fill. The big thing was 1959. Out of nowhere, they not only win the pennant, they win the World Series. 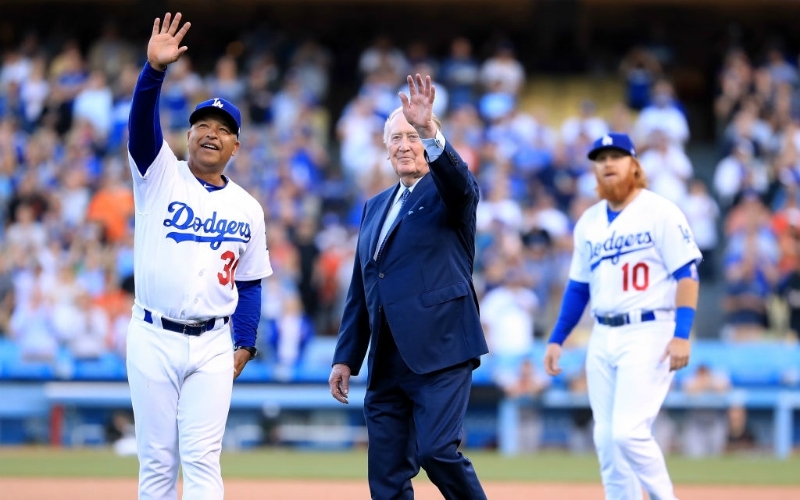 That was the major step where the Dodgers all of a sudden became part, and eventually the heart and soul, of the Southern California community. Walter O’Malley knew exactly the stadium he wanted. During spring training in the early ’50s, the Dodgers didn’t really have any kind of stadium in Vero Beach. What they did was an experiment. They dug a hole in the ground. And the stands were along the sides of the hole. That was the beginning of the idea, the germ of the idea of Dodger Stadium. To build in L.A., the first thing they had to do was move a huge amount of dirt. Those earthmovers were spectacular. Big, heavy pieces of equipment, sliding along the inside of the saucer. It took your breath away how they could somehow manage the equipment without sliding and turning over and rolling down the sides. That was the fulfillment of the experiment in Florida: Dig a hole, and use the sides of the hole. “I come from Ecuador, and in Quito, where I lived, they don’t play baseball. I never saw a baseball, I never saw a bat before I come to this country in 1955. Next articleHere’s Where People Will Be Protesting Trump’s Visit to L.A.